A new malware threat is working it's away around the web over the last 48 hours. We have starting seeing instances of malicious piece of spam hit our servers. The emails are meant to appear as an Invoice from ADP that includes a PDF file. The email appears with a subject of FW: Invoce_XXXXXXX or Past Due ADP Invoice. The invoice number is different in each email as is the name of the sender. In most cases, the email appears to be coming from an @sage.co.uk email address. This particular spam campaign appears to be another one from the current zbot runs which try to drop cryptolocker, ransomware and other malware on your computer. They are using email addresses and subjects that will entice a user to read the email and open the attachment. This particular email would look familiar to those in the financial and business community. A very high proportion are being targeted at small and medium size businesses, with the hope of getting a better response than they do from normal everyday people. We are currently taking steps to adjust the filters on our end to capture similar emails going forward. If at anytime you are skeptical of an email you have received, please feel free to reach out to us for assistance. You can also find some additional steps on how to handle suspicious emails here. As we all have seen or heard, this type of malicious activity is becoming increasingly common, especially to organizations with established, trusted brands. 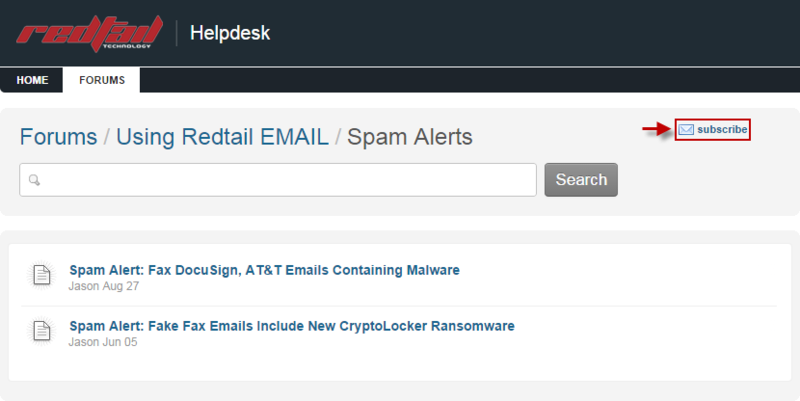 To receive email notices when new alerts are posted, please got to Forums > Using Redtail Email > Spam Alerts with Redtail's helpdesk and click the Subscribe option in the forum header above. Note: Make sure you are not within the actual article when selecting to subscribe as this will only subscribe to that particular article.